Mumbai: A 30-foot whale washed up on the Juhu beach in Mumbai on Thursday night. The whale, said to weigh around four tonnes, was spotted after 10 pm. Police and forest department officials are examining the animal, which experts say is a Bryde's whale. Cranes have been called in to remove the remains. Officials believe the whale has been dead for two or three days. "There could be many reasons - sound pollution under water, pollution from industries, plastic consumption, or even disease, since the animal has no external injuries," said Animesh Limaye, an expert from Reefwatch India. 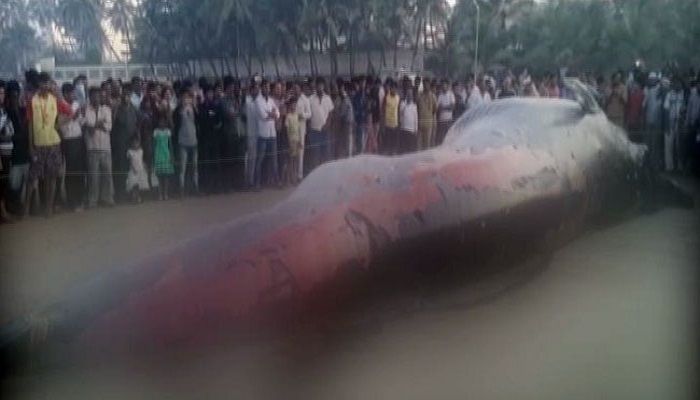 This is the second biggest whale to have beached along the Maharashtra coast. Last year, a blue whale washed up at Alibaugh and died after a 10-hour struggle to push her back into the sea. Earlier this month, 45 dead short-finned whales washed up at a beach in Tamil Nadu's Tuticorin district. Around 40 more that were also stranded on the beach were saved. Officials suggested that the whales ended up in Tuticorin after travelling thousands of kilometres from the Pacific.